Once upon a time there was a father who can be called Mario. Mario had a six years old son that we can call Paolo. 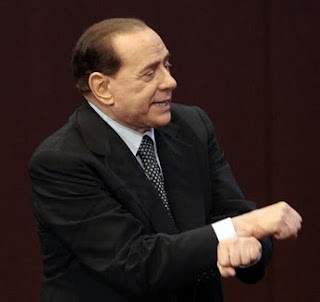 Mario and Paolo’s country had a prime minister that we can call Silvio. We could call him in other ways, but I don’t want to seem vulgar. One evening Mario was sitting on a sofa watching the news and, as it often happened, Paolo was on the carpet, at the feet of his father, intent on drawing. The child drew absorbed, but at the same time he listened to the words of the television news man. "Daddy..." he said while continuing to paint the house surrounded by trees and bushes. "What does legitimate impediment means?" Mario watched the child and hesitated a moment before answering. He was obviously acquainted with his son and he knew that he should have been clear and comprehensive; otherwise Paolo would not let him free to watch TV news. "Well," he said after collecting the ideas, "you must know that there is a man, Silvio, who is the head of our country. There are some people, magistrates, who think he did something not good…"
"And what about the magistrates? Are they bad?" "No… the magistrates are neither good nor bad. When they come to know that someone has done something not good, they want to do a meeting with him to understand if he is guilty or innocent. This meeting is called trial." "What happens if someone does not go to the trial?" "Bravo, that's the point! Everyone must go to his trial, otherwise all people may do what they like. They can steal, hurt other people, because nothing happens." "Did Silvio go to his trial?" "No... Silvio is the head of the country and he is very powerful. So, since he doesn’t want to go to a trial, along with other friends he found some excuses for not going. For example, a friend of his named Melchiorre Cirami invented the legitimate suspicion." "It means that when he is called to a trial, Silvio can say that the magistrate hates him and then he may call another one." "And if it is not true that the magistrate is angry with him?" "Silvio may call another one the same." "Wait, it's not finished here. Another friend of Silvio, Renato Schifani, invented that magistrates cannot call to a trial those who are head of the country." "Yeah, but in this kind of game there is a referee, the Constitutional Court. The referee said that this is not true and rejected the Schifani’s idea." "So now Silvio must go to trial?" "No, because another friend of his..."
"How many friends does Silvio have?" "Many. I said, another friend of Silvio, Angelino Alfano, has tried again with the idea of Schifani, the one that magistrates cannot call to a trial the head of the country and once again the referee said it is not possible." "Sorry, Dad, but this is not smart, if it was not true before... "
"Yes, but the referee decided after a year and so Silvio has earned time." "Now, another friend of Silvio, Michele Vietti, found another way to not make him go to a trial: the legitimate impediment, the words you've heard before. It means that Silvio’s trial postponed for about a year because he is the head of the country and has many things to do. Well, now let me finish watching TV. " Mario started again to follow the news, but Paolo had forgotten the drawing and still observed his father. "Daddy..." Paolo said pulling his pants. "Yes ...?" Mario answered without stopping to watch the screen. "Dad, is Silvio innocent or guilty?" Mario looked at the watchful eyes of his son and realized that he must abandon the news. "Listen," he said, shutting off the TV with the remote, "the trial is precisely a way to understand it." "So Silvio could also be guilty?" "Dad… this is not good." "That Silvio could be guilty?" "No... That someone who is the head of the country could be guilty..."
The News: Legitimate impediment to the Chamber of deputies. Stories and News, the Storytelling show: February 12 2010, Rome.